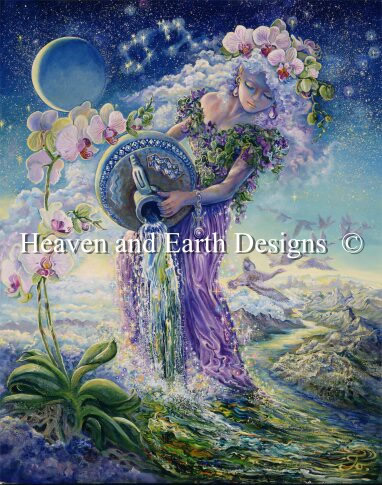 Aquarius is the Water Carrier (or Pourer) but is an Air sign ruled by Uranus and Saturn. 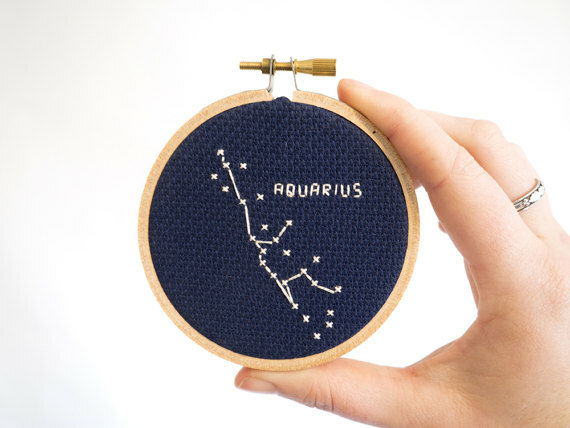 Aquarians are both between 20th January and 18th February. The constellation of Aquarius is found in a region often called the Sea due to its profusion of constellations with watery associations such as Cetus the whale, Pisces the fish, and Eridanus the river. At apparent magnitude 2.9, Beta Aquarii is the brightest star in the constellation. Aquarius is identified as GU.LA "The Great One" in the Babylonian star catalogues and represents the god Ea himself, who is commonly depicted holding an overflowing vase. The Babylonian star-figure appears on entitlement stones and cylinder seals from the second millennium. It contained the winter solstice in the Early Bronze Age. In Old Babylonian astronomy, Ea was the ruler of the southernmost quarter of the Sun's path, the "Way of Ea", corresponding to the period of 45 days on either side of winter solstice. Aquarius was also associated with the destructive floods that the Babylonians regularly experienced, and thus was negatively connoted. In Ancient Egypt astronomy, Aquarius was associated with the annual flood of the Nile; the banks were said to flood when Aquarius put his jar into the river, beginning spring. In Greek mythology the water carrier is Ganymede, a beautiful Phrygian youth. Ganymede was the son of Tros, King of Troy. While tending to his father's flocks on Mount Ida, Ganymede was spotted by Zeus. The king of gods flew down to the mountain in the form of a large bird, whisking Ganymede away to the heavens. Ever since, the boy has served as cupbearer to the gods. Finally, you may have heard of the Five Peaks Challenge? I run five blog hops per year (see this page for details). Anyone who takes part or comments on all five hops will be entered into a draw at the end of the year. 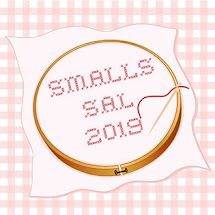 Taking part is obvious but as not everyone can take part in all five you still get a chance if you comment on my post which is hosting the Blog Hop. If you take part AND comment on the post, you get TWO entries into the draw. 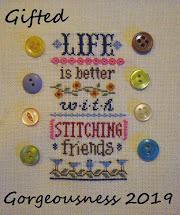 The first Hop is the Secret Stitching Sweetheart on 14th February and you still have time to sign up to take part. If not, then remember to leave a comment on my Blog Hop post. What an interesting post! I love the Dragons... may have to add that to my very long to-do list at some point! Aquarius fits in beautifully with your previous ones on the Donna Kooler . The thread colours are so lovely on the darker fabric. The Donna Kooler Zodiac sampler you're putting together is coming along beautifully! And the other one looks so sharp - really pops on the black. Love that you used You Were Hatched as your son's birth sampler - so much fun and such marvelous execution of a gorgeous design. Your Zodoac piece is really coming along nicely. The colors are beautiful! !Thanks for all the info on the different signs. 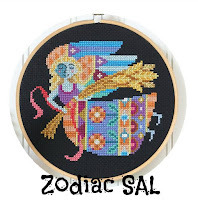 I didn't know you did a zodiac SAL, great idea but for now I'll pass as I have quite a few things on my stitching list. Aquarius is our daughter's sign, there's a couple characteristics that match but not all. Love your Donna Kooler zodiac piece and the TW dragon is gorgeous. The zodiac sampler is looking good. The Millenium Blue fabric you chose is a great fabric choice. Was it the recommended fabric for the pattern?How nice of you to include bloggers who leave comments on the blog hop post. Another great zodiac post. I don't have any Aquarius people in my family. Your stitching looks great. The Donna Kooler one is really neat on that fabric. Love your Hops challenge and I will do my best to join in each time. 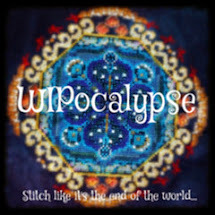 I love your blog hops. Thanks for hosting them for us to join. A really interesting Zodiac post, Jo. My elder sister is an Aquarius and I do recognise a few of those traits in her. I love the floss colours on your Kooler Design piece. 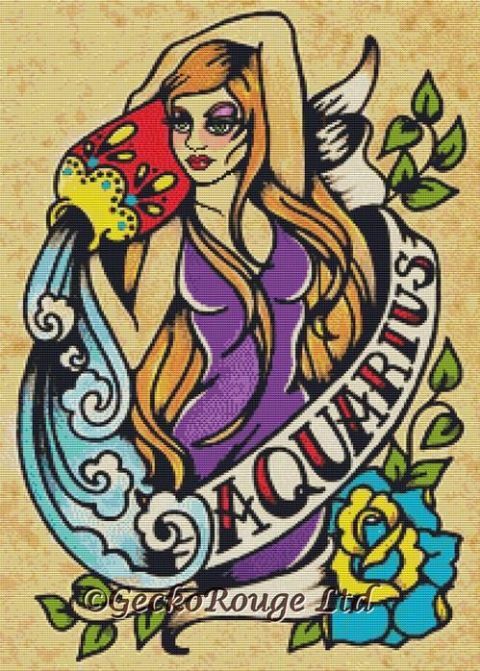 I'm an Aquarian! I do recognise myself in a few of those statements but then I think everyone can find something in any horoscope that applies to them. I love how the Donna Kooler sampler is turning out, and what a cool birth sampler for your son! Oh my, it is already time for another sign of the Zodiac. Whenever I hear the word Aquarius I have to think of the song by 5th Dimension. I think it's a musical song but I'm not sure. Another title is Let the Sunshine in. Wonderful, your Donna Kooler designs on the blue fabric. Your growing Zodiac piece looks great, Jo! That TW piece, though... hubba hubba!!! Your Zodiac is going to be perfect, Jo!!!!!!!!!! Love the designs and the colours. Kisses!!!!!!!!!! Love your post... my boss is an Aquarius... he is a great boss and I will miss him when he moves onto his next role on the other side of the world in the next couple of months! 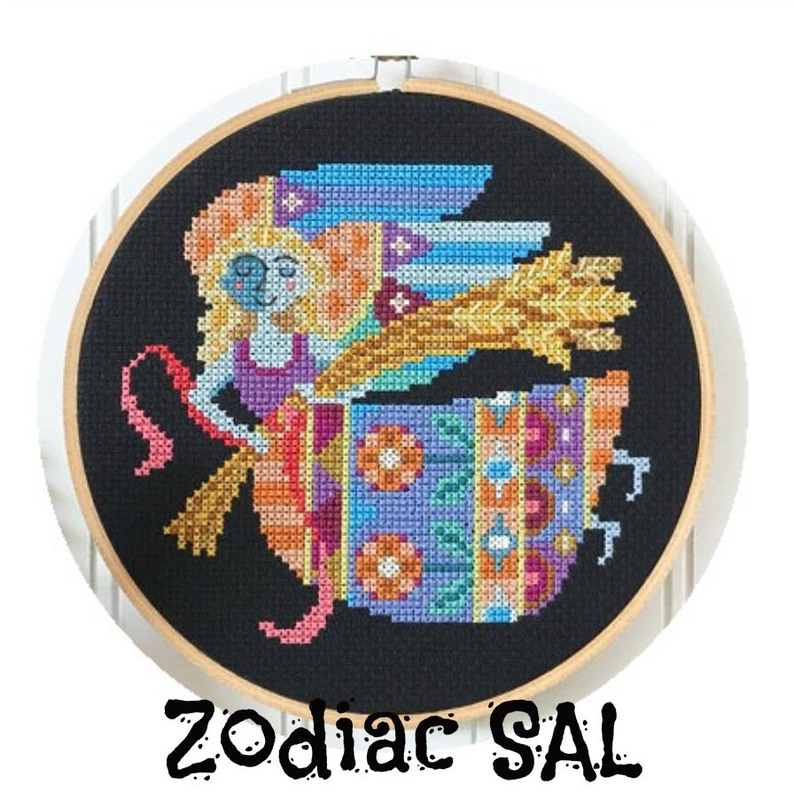 I had great plans to keep up with my Peekaboo Pals for this Zodiac SAL but for small designs they are very time consuming to stitch! Love your stitching Jo. 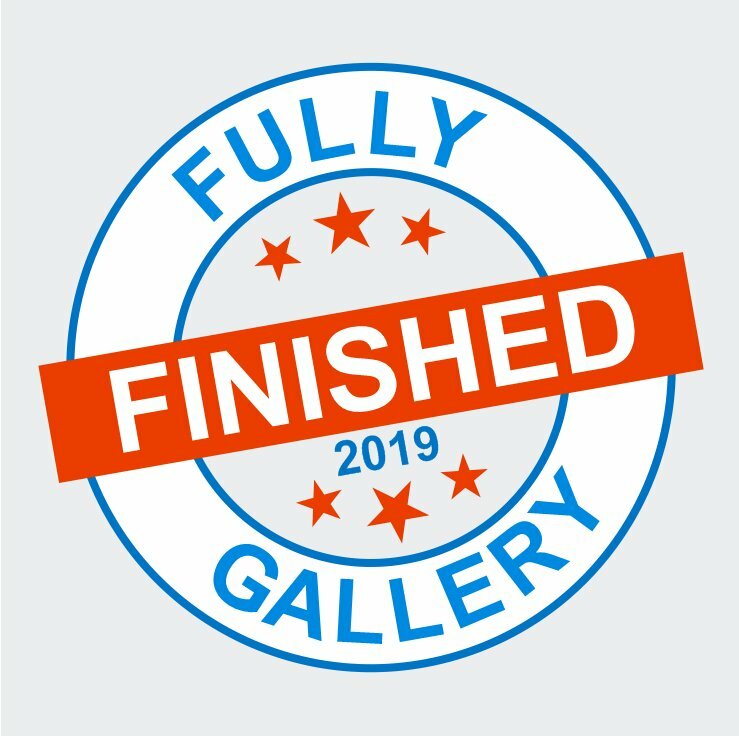 I finally posted my start. 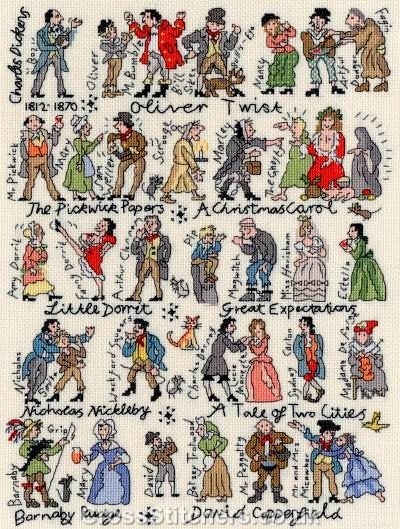 I don't stitch a lot of TW; but I love Christopher's sampler.